Of historic days once in four years. Yesterday (Saturday) had to have been one of the most hectic days of my life, yet I spent most of the day sitting on my bed. I’m part of a team that’s trying to bring something fresh and fabulous to the health care sector in Nigeria and I had the responsibility of doing the initial leg work online, we’ll talk it a bit more later. It all started with an innocent picture. Earlier today, I was on Facebook saw this picture on an Igbo group that I belong to. 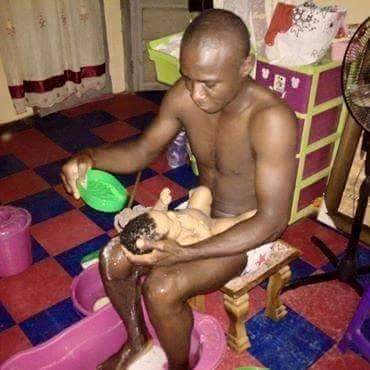 The picture was posted with this caption “Hello Friends… is it proper for a man to bath a new born baby?” As with everything on social media, a hot debate ensued on the appropriateness of a father bathing his own child. The Social Media Week Lagos is still on, it’s still lit, it’s still rocking hard. The number of attendees has steadily increased and the tempo and quality of the discussions has been sustained. For me, it has been goldmine of opportunities and connections, you could literally be sitting across from a person who has answers to your most burning questions- I saw that happen several times today.